My first interview in 9 years! Eek. 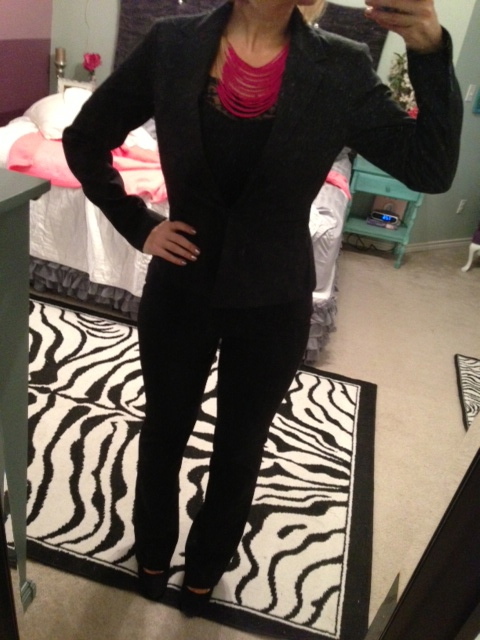 I had to buy a whole new suit, everything I had from the last time I worked was a size 14-16. I've sent out 30 resumes and only had one call back, yikes. Honestly this position is EXACTLY what I'm looking for and they seemed to really like me, keep your fingers crossed! Lets all pray I don't have to stay home long, my husband said I'm a TERRIBLE babysitter. What am I to do when she's throwing a tantrum because she wants to go home and put on a party dress?? She may have taken, not one, but TWO naps in shopping carts. I also wanted to take some time and ask for your support. One of my readers, Jacy, is part of a group of running Mom's who wanted to help out the families of Sandy Hook. 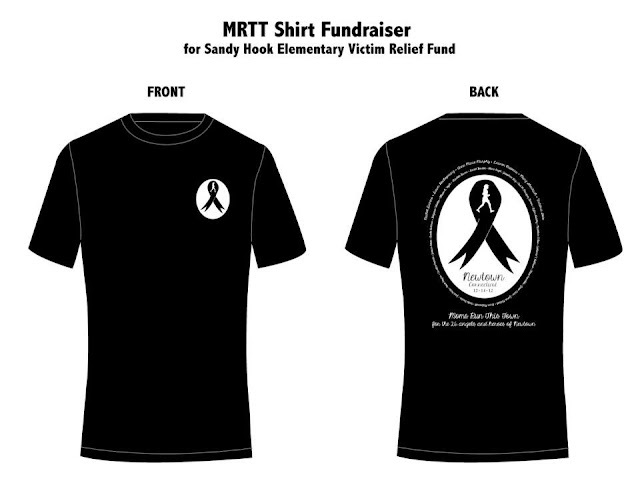 They designed this amazing shirt and all proceeds will go to help the victims families. The logo is surrounded by the names of those that died in the attack on December 14th, with the outer ring being the teachers and adults that protected. The inner ring is the names of the 20 children that died. Please consider helping out and buying a shirt, I did. Click here to purchase the shirt for $20. Love the POP of color from your necklace!! Looks good. And, I like those shirts, I hope they still have them just AFTER Christmas, b/c I want to get one. Good luck! Fingers crossed you got it!! Just bought the shirt, had seen it earlier this week - but your post reminded me to buy it. Also participating in the #26randomactsofkindness project. God bless these families. Good luck on your interview! You look great! Good luck skinny mini. I hope you find a job that you love. That shirt is an awesome idea! I'll most definitely be getting one. I have been looking for a way to help the families and this is it. Thanks for sharing! Thank you Megan, on behalf of my running group, we THANK YOU SO MUCH and really appreciate you sharing this link with everyone. Hope your interview goes well. :) You look great. You looked so gorgeous in that suit! Fingers crossed for you in the job hunt! AWESOME cause with the shirt! I'll have to lookinto gettin me one of those :) happy Thursday lady! Thank you so much for spreading the word on the shirts!!! we are getting up there in numbers!! would LOVE to get more!! Good luck on your interview. I love Madison's outfit! I would wear something similar every day if i could! Let us know how it goes. I was thinking of you girl all day. You are so funny!! Bad babysitter or really damn good one? Fine line! Fingers crossed about the job! 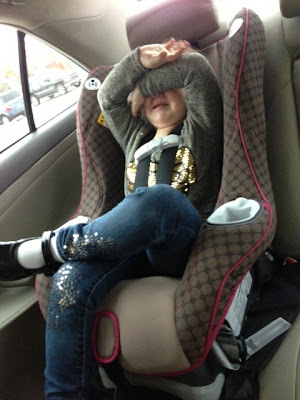 That car seat picture is priceless! I would be at a complete loss trying to raise a girlie girl. I could've cared less about what I wore when I was a kid and something tells me I wouldn't have the patience for the wardrobe meltdowns you and Mel describe! crossing my fingers for you!!!!! Good luck with the job interview!!! I would think that looking for a job this time of year would be hard with the Holidays. So keep that in mind when they don't call back, they just might after the holidays. Love Madison's sleeping outfit! She is so stylin. You look great! I'll be praying you get the job! We all know YOU deserve it! I'm also going to be purchasing a shirt after Christmas. SUCH a great idea! Merry Christmas, sweet friend! XO!